For over two decades, Timmi Jandro + Heather Askinosie have joined forces and elevated the world with their passion for crystals through their company Energy Muse. Growing up as childhood friends, these goddesspreneurs have been interested in mysticism since little girls. Recently, I had the pleasure of visiting these ladies at their beautiful space to talk about all things Crystals. As these gifts from the Earth continue to grow in popularity, their’s a lot more to them than just buying a stone. These crystals are here to help us transform our lives. In this life, we’re bound to face obstacles and challenges. I mean, we’re here to grow, right? As we embark on this journey of transformation and alignment, we can begin to see these challenges as opportunities, allowing us to reclaim our power. We are living in times where we are REQUIRED to be living at our highest be-ing. This is the time for us to share our Truth with ease and grace. Crystals help us ground into our be-ing and with simple rituals, we allow ourselves to be in communion with the healing powers these stones carry. Crystal Muse, Everyday Rituals to Tune in to the Real You will be your new favorite coffee table book. Not only are the images stunning, but you'll be getting the tools and rituals to help you thrive during the Golden Era. The practices in this book have been collected for over 25 years. The rigorous research, traveling, and spiritual quests up until now allow this alternative healing practice to support you as you build your queendom with grace. As we mentioned in the episode, you can use the code SHAMANESSA20 over at EnergyMuse.com to get your crystal toolkit ready to go! What I know for sure, since I began actively working with crystals, I've been able to manifest my wildest dreams. Not only have I experienced deep healing within my psyche, but I've also been able to open my heart and align to the miracles that've been waiting for me to realize. The key to manifesting is that when you allow yourself to vibrationally align to what it is you truly want, you'll receive. Ask. Believe. Receive. The crystals are always working behind the scenes, so just because you aren't getting it on your terms or on the timeframe you want it to manifest, it doesn't mean it isn't happening. Patience is everything. Allow yourself to ground into your be-ing. Honor the journey. Trust the Process. 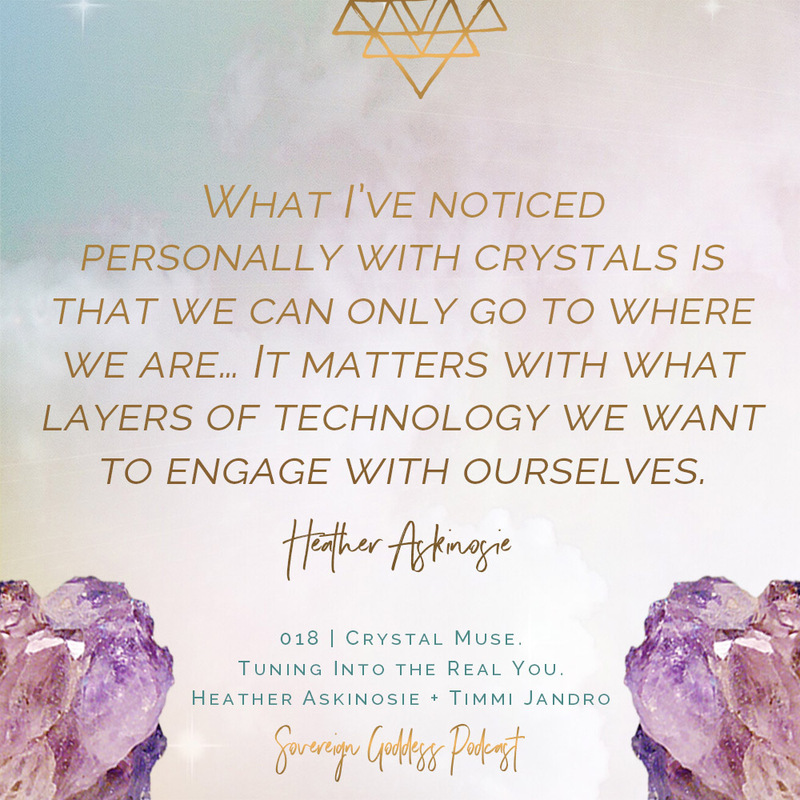 Heather Askinosie is a leading influencer on the power of crystals, Feng Shui, and holistic healing. For over 25 years, she has had the privilege of studying with the best healers from all over the world, who have passed down ancient teachings on how to utilize energy technology. In 2000, Heather co-founded Energy Muse with business partner, Timmi Jandro. Energy Muse is a conscious lifestyle brand, providing tools of empowerment, inspiration, and hope in the tangible form of jewelry and crystals. Together, Heather and Timmi are helping people reconnect with the energy of the Earth to align with their highest self, realize their true calling, and tap into their own personal magnificence.